Karen came to the RCD in 1995 as a volunteer, and over the following 19 years, she has built the organization into a groundbreaking, critical hub for land stewardship and conservation in Santa Cruz County and throughout California. Karen stepped down from her post as Executive Director this week to focus on her health. She will remain as a strategic advisor to the organization. As her role changes, we’d like to share a little about what Karen has done for the RCD and for the community. When you ask any environmental professional in Santa Cruz County about Karen Christensen, you are bound to hear the same responses over and over: Collaborator, Leader, Visionary, Innovator. 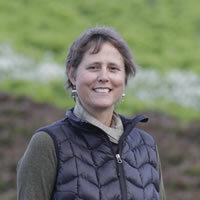 Through these traits and her consistent themes of partnership and trust, Karen has accomplished innumerable successes in improving water quality, creating new approaches to water supply issues, preserving and restoring habitat, conserving resources, and creating new ways of achieving conservation goals. She has led her organization, her community, and beyond by bringing new models of cooperation instead of regulation to solve complex local, regional, and statewide issues. At the Resource Conservation District of Santa Cruz County, our staff often struggles to describe exactly what it is that we do, simply because we are doing so much to advance conservation goals in the county and beyond. Because Karen has accomplished so much and inspired so many, it is impossible to quantify or make a simple list of all of her achievements. Here, we are just highlighting a few of the programs she has led during her years at the RCD. Each of these programs has resulted in significant, measurable changes in water quality and/or restoration of sensitive habitat. And in all cases, it has been done through partnerships and voluntary action, not regulatory action. In addition, each program has effects beyond Santa Cruz County and provides a model for statewide conservation. The Integrated Watershed Restoration Program (IWRP), in place since May, 2002, is a voluntary framework for watershed partners to coordinate planning, funding, permitting, prioritizing, monitoring, and outreach for watershed restoration projects. IWRP has been heralded as a model for collaborative, integrated watershed conservation by our local partners, our key funders, as well as our state and federal partners. Due to the Program’s success in identifying, developing, and implementing high priority restoration projects, the staff and management at the National Marine Fisheries Service, US Fish and Wildlife Service, and the California Department of Fish and Wildlife requested that the State Coastal Conservancy expand IWRP and its associated funding to cover the neighboring counties of San Mateo and Monterey. In the 11 years since IWRP's inception, the RCD and its partners have been able to design, permit, and construct over 80 water quality improvement and habitat restoration projects throughout the County. The Partners in Restoration (PIR) Permit Coordination Program is an outgrowth from and integral facet of the IWRP Program. It provides a streamlined process for navigating the complex web of environmental permitting for landowners wanting to implement voluntary conservation projects. Modeled after a watershed-based pilot program in Elkhorn Slough, Karen envisioned the first countywide program to address the breadth of diverse resource concerns that exist in Santa Cruz County. The program requires first a heavy investment of time upfront from regulatory agency staff to develop the conditions and standards for the program and then a hands-off approach for implementation. Due to her reputation of integrity and consistency, it was Karen who was able to develop a strong relationship with the regulatory agencies and gained enough trust to convince them that this was worth the risk. Through the PIR Program, more than 90 restoration projects have been implemented in nine years and the program has become the most successful in the state of California. The Livestock and Land program has been improving local water quality since 2002. Its goal is to educate horse and livestock owners about practices which reduce the transport of nutrients, nitrates, pathogens and sediments to streams, creeks, and rivers. The program was created in response to regulatory interest in livestock facilities and management to achieve water quality. Karen helped facilitate the necessary partnerships with local and state resource agencies and landowners to build and support a non-regulatory approach to achieving water quality improvements. The program is a strong example of a successful partnership with local nonprofit Ecology Action, and has been effective not only in Santa Cruz County but has been exported to now represent over 13,000 sq mi. throughout the entire Central Coast Region of California, spanning all the way from Santa Barbara County north through San Mateo County. The Community Water Dialogue is an example of a proactive community solution to an archetypal California water dilemma. The Pajaro Valley basin aquifer is widely understood to be in overdraft, resulting in saltwater intrusion into the groundwater resources. For years, the discussion around water in the Pajaro Valley was contentious, controversial, and unproductive. With Karen’s guidance and vision, the RCD helped lead the community toward a positive and solutions-based approach, forming a voluntary group consisting of farmers, landowners, nonprofit groups, interested private companies, and government agencies. Now four years into the effort, the primary goal of working together to address overdraft and the resulting issues, is manifesting in on-the-ground, community-led projects, including an innovative water conservation project, managed aquifer recharge, and water storage and delivery projects. The spirit of collaboration created in this project has spilled over to other areas of the community life. The SC3 Ecosystem Services Initiative aims at assessing the economic value of natural systems in the region, return on past investments in conservation (over the past 30 years), and establishing a defensible baseline and model to predict potential economic return of alternative future investment scenarios. Built as a partnership between Sonoma County Open Space and Ag Preservation District, Santa Clara Open Space District, and the RCD of Santa Cruz, the RCD and its partners seek to better inform various decision-making processes affecting land use and economic development, and to form new alliances with non-traditional partners, break down traditional planning silos and find new and innovative ways to future integrate conservation in transportation, water infrastructure, and public health planning. This effort represents, perhaps, the clearest example of how Karen is constantly expanding the RCD's reach and vision to not only include new partners and new paradigms, but to create a common lexicon that builds a solid foundation of equity, common purpose, and focus on the greater good. The Santa Cruz County Early Mitigation Partnership (SCCEMP) is an effort led by the RCD and its local partner the Santa Cruz Regional Transportation Commission (RTC). This effort is designed to promote and facilitate early planning and coordination for transportation improvements within the county in an effort to avoid impacts to critical resources and to simplify mitigation for unavoidable impacts by using the RCD's IWRP process as a tool to identify and implement local mitigation. If implemented as designed, this MOU will (a) save taxpayers significant funds by reducing delays for transportation projects through streamlined, yet more ecologically effective mitigation; (b) ensure that mitigation funds from local transportation projects are reinvested in local conservation projects; and (c) will foster early coordination between transportation agencies and resources agencies to reduce impacts and increase benefits of transportation projects. To date, no regional or countywide MOU's for transportation mitigation have been signed and our local effort could become a model for regions throughout the state. Coordinating the development of the Santa Cruz County Integrated Regional Water Management (IRWM) Program, addressing issues of water supply, water quality and habitat in the County. Karen was on the initial team to develop the IRWM, and also sits on the board of the Regional Water Management Foundation, the administrator of the IRWM Program. Santa Cruz is the only region in the state that uses a community non-profit organization as the lead administrator for its IRWM Program. Assistance with water supply issues throughout the county, including helping mediate a longstanding dispute over the City of Watsonville’s diversions from Corralitos Creek, and leading a new effort to coordinate a plan for optimizing beneficial uses of College Lake between diverse and historically opposing stakeholders. Establishment of a countywide “Watershed Awareness Campaign,” which includes the placement of over 130 eye-catching blue signs around the county identifying the names and locations of local creeks and watersheds. MOU with State Parks to share staff and resources to help State Parks address chronic erosion on roads, implement habitat restoration, and facilitate resource management on State Park Lands. Assisting the USDA Natural Resource Conservation Service in federal delivery of conservation services at the local level (e.g. hosting their offices, providing outreach services to growers for Farm Bill programs, jointly sponsoring programs such as Livestock and Land, Rural Roads). Fire prevention, in the form of fuel load reduction and chipper services. Rural roads assistance (e.g. grading, replacing culverts to reduce sediment transport to waterways). Invasive plant removal in sensitive habitat areas. Outreach and assistance to Spanish-speaking farmers regarding conservation issues. Development of a watershed education handbook and curriculum entitled Watershed Cruzin’, in addition to countless other education and outreach efforts and initiatives. Development of initiatives to reduce the impacts of stormwater runoff, including publishing and distribution of the popular “Slow it. Spread it. Sink it.” stormwater guide for landowners. Creation of "Blue Circle" meetings, a means to bring local agencies, governmental and non-governmental groups to gather in regular, informal settings to build relationships and exchange views on natural resource issues. Karen Christensen’s many achievements have been anything but a “one-woman show.” Rather, it has been a steady, non-ego based approach of collaboration, listening, principled leadership and trust building that has created real changes locally, regionally, and statewide. Finding ways to make her ideas and programs affect others and replicate successes around the state has been a constant theme in her push to advance conservation issues. Karen’s unsurpassed vision, her relentless drive, her creative inspiration, and her unfailing commitment to coordination, partnership and outreach has made her a leader unlike any other.